Written by Alyssa DeLeoNEUR. Coffee & Conversation is a series of informal chats with women faculty on campus, hosted by Tufts GWiSE. Our last Coffee & Conversation of the year featured Dr. Laverne Melón, a post-doctoral fellow in the Maguire lab and a TEACRS scholar. She will joining Wesleyan University as a faculty professor in neuroscience in the Fall. Laverne was born in Trinidad and moved to New York when she was 10 years old. In high school, Laverne helped establish the science club, which she insists was the most poppin’ after school extracurricular at the time, and she knew she wanted to work in research before even knowing what that was. The science club gave her and her peers the chance to support each other in the search for research experiences and ultimately lead her to volunteer in a cancer genetics lab at Columbia University. As she reflects on her first experience in science, she also acknowledges that it was also her first exposure to the sexism and racism that exists in scientific institutions. It’s difficult to turn a blind eye to these situations when all you want to do is put your head down and do the work in front of you. But, she didn’t let this taint her passion for the field and her experiences spoke to her resilience, which would be noted by several scientists later in her career. Laverne went on to earn a BA in neuroscience at Middlebury College, a MS in Behavioral Neuroscience at Binghamton, and a PhD in Addiction Neuroscience at IUPUI after her lab at Binghamton moved. She lost a Binghamton fellowship in the move and had to teach at IUPUI, which she found frustrating as anyone does when they’re forced to do something. However, Laverne began to enjoy the process and her career path in academia became increasing clear. 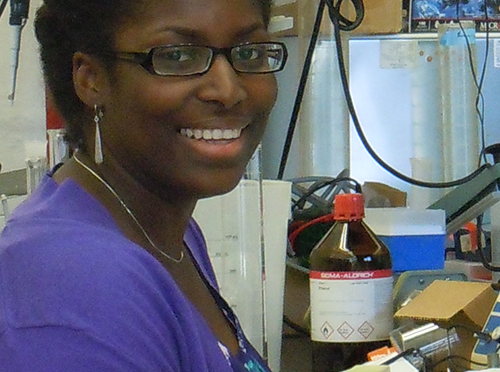 Laverne has been a post-doc in Jamie Maguire’s lab for the last 4 ½ years studying effects of stress on reproductive health and the role of the GABAergic system in alcohol addiction. As she moved into her post-doctoral years, she was really fueled by a research question which she presented to Jamie along with some data to score her current position. Now, she’s fielding multiple offers for faculty positions and learning to navigate this new part of her career. As always, we chatted about how early life experiences brought our guests to their current positions, how crucial the role of mentors played in this trajectory, and the vital importance of self-advocacy. But, we kept coming back to this idea of producing good, reproducible science and how that is only possible if the field really cared about the people behind the data. It’s no secret that scientific institutions have not been the best advocates for the health of their workforce. Levecque et al. published a study in May of 2017 reporting one in two PhD students experience psychological distress and 1/3 of graduate students are at risk for a psychiatric disorder. An online survey of graduate students in a recent March 2018 study by Evans et al. reports graduate students are more than six times as likely to experience depression and anxiety compared to the general population. SIX times! It’s exceeding clear that health of scientists across fields and levels are struggling in this environment. This begins by hiring scientists that are more than a good researcher, but are inspired teachers, passionate mentors, and expert managers who are in touch the health of their lab. As Laverne is beginning the next chapter of her career, she’s considering taking on an administrative position as a director of inclusion and diversity in addition to her faculty appointment. She intends to use her status to implement institutional changes to allow for better science through caring, supporting, and mentoring the next generation of scientists. When Laverne started to work in science, she admitted she tried to assimilate as much as possible, but it gets exhausting. It’s difficult to integrate into establishments and systems that have been hostile to the existence of women and minorities in science while trying to stick it out until you can get to a position to make changes. She’s been able to tap into her mentoring network over the years for support and instructed us to be vulnerable in our insecurities to allow these organic mentorships to grow. If you’re interested in getting involved with GWiSE, follow us on Twitter @TuftsGWiSE, like us on Facebook, or email us at tuftsbostongwise@tufts.edu. Our next Coffee & Conversation is October 19th, 2018 at 5PM in Jaharis 913. The main responsibility of a biomedical researcher is to produce novel, trustworthy science that will improve human health. We may not be doing enough towards this goal, however, if we consider our research results to be our only impact on the human condition. How we conduct our research is just as critical as the results of our research, especially when it comes to the environmental footprint that research laboratories leave behind on university and medical campuses. Tufts is not the only university facing these issues. Harvard University labs consist of 20% of physical campus space but account for 44% of their energy use, and MIT labs take up less than a quarter of campus space but account for up to two-thirds of their energy use. So, if scientists like to talk the talk when it comes to best practices in advocating for governmental and community support of sustainable practices, how can we commit to similar support within our own institutions? Many universities, including Tufts, have implemented Green Labs initiatives in order to develop environmentally friendly research laboratories using a classic sustainability framework: reduce, reuse, recycle. Based on resources from Tufts’ Green Labs Initiative and similar programs at other institutions, here are some starting points for making laboratories and research facilities more sustainable. 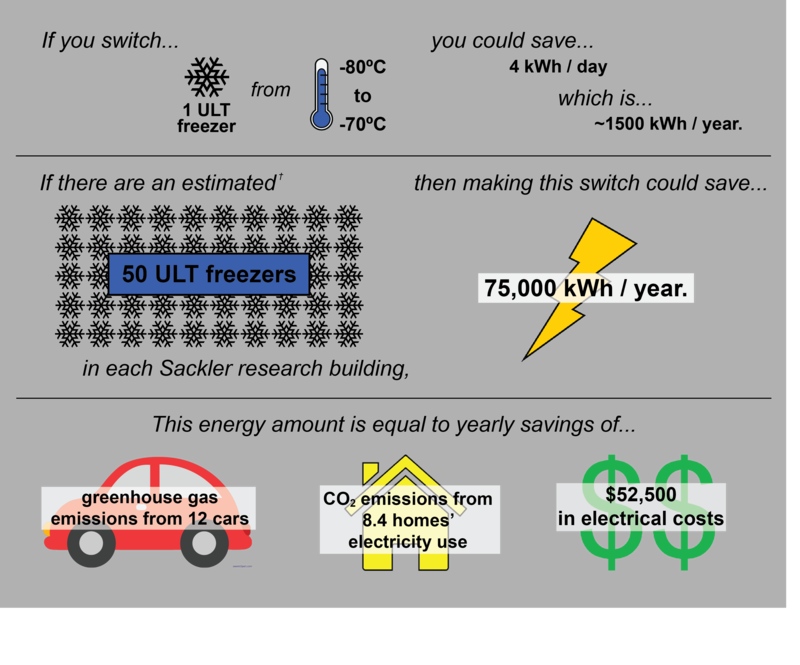 Energy: Labs can significantly reduce energy usage by maximizing the efficiency of their ultra-low temperature (ULT, or -80°C) freezers, as in one year, a single ULT freezer uses the same amount of energy as an average American household. Frequent de-icing, regular upkeep, and maintained organization all decrease the amount of work and time (and thus energy) required by freezers to decrease temperature to the set point. To encourage these approaches, Tufts joined the International Freezer Challenge in 2017, which “rewards best practices in cold storage management”. Of note, three Sackler labs–the Munger lab, the McGuire lab, and the Bierderer lab–participated. 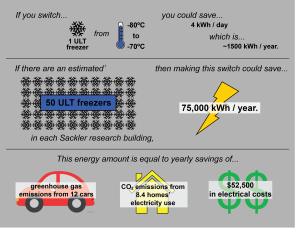 Additionally, a less universally advertised, but possibly more effective, approach to reducing energy usage by ULT freezers is changing their set temperature. 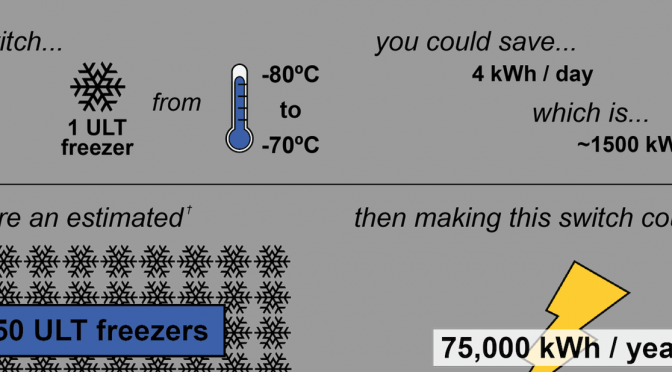 The University of Colorado at Boulder has accumulated a significant amount of information demonstrating that maintaining ULT freezers at -80°C may not be necessary, as many sample types are capable of being stored at -70°C without any significant loss of quality. Though seemingly trivial, this ten degree difference has huge implications for lowering energy usage , which also translates to reduced energy costs (Figure 1). By rough estimation, Tufts could save close to $50,000 per year on electricity if all ULT freezers in Jaharis, M&V, Stearns, South Cove, and Arnold were adjusted from -80°C to -70°C. †Number of ULT freezers was calculated by presuming 5 freezers per floor in Jaharis 6-9 and 10 freezers per floor in Jaharis 3-5. This estimate was extended to the remaining buildings on the Sackler campus. Figure 1. Yearly energy expenditure & cost savings for ten-degree increase in ULT freezer temperature. Closing and/or turning off chemical fume hoods when not in use also mitigates electrical expenditure. At the Medford campus, undergraduate student Emma Cusack led a “Shut the Sash” initiative last year in order to reduce energy use and cost. 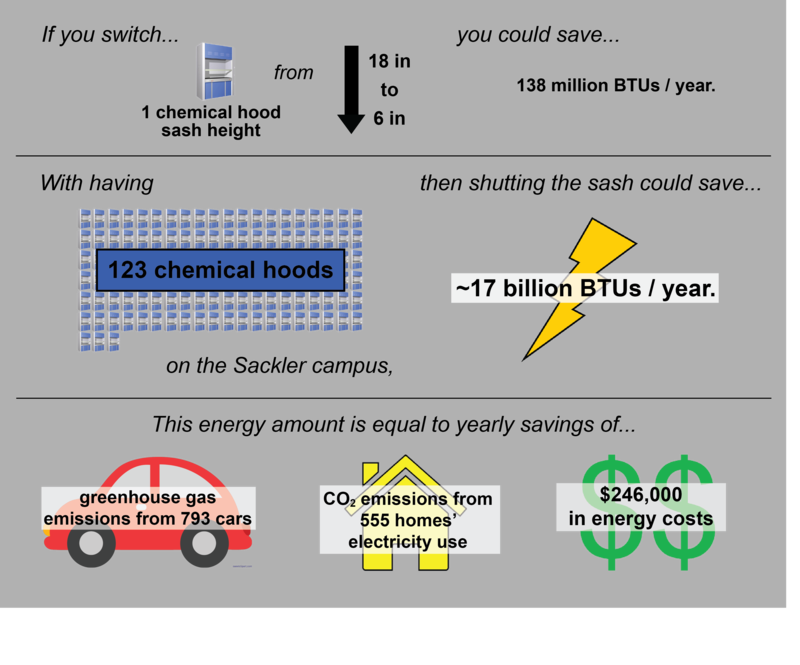 Based on consultations with the Tufts’ Office of Sustainability about her work, it is estimated that lowering sashes of all 123 chemical hoods on the Sackler campus from 18” to 6” when not in use would result in yearly energy expediture savings of around 40,000 kWh and energy cost savings of over $200,000. Figure 2. Yearly energy expenditure & cost savings for reducing sash height of chemical hoods. Lastly, powering down non-essential lab equipment overnight and incorporating timers into power sources are also simple but meaningful methods of lowering energy usage. The latter method is especially helpful to maintain convenience along with energy efficiency, as incubators and dry ovens are shut off overnight but can still be ready-to-use upon arriving in lab, for example, if set to turn on in very early AM. Water: A traditional autoclave requires 45-50 gallons of water per minute when in use, and this massive usage is due to the need for continuous addition of water for cooling steam condensate before draining into sewers. Equipment like Water-Mizers use real-time monitoring of drain temperature to add water for cooling only when needed, reducing water usage by at least half. Also, being mindful of when sterilization is actually required for equipment and using dishwashing services as an alternative also contributes to lowering water usage. Within labs, addition of low-flow aerators to faucets and switching vacuum sources for aspirators from faucet-style to vacuum-style can also can significantly reduce water usage. Finally, being conscious of when it is really necessary to use distilled or deionized water, as the process wastes water that does not pass the filtering thresholds, can also contribute to making water usage by labs more efficient. Materials: Styrofoam shipping containers and freezers packs can accumulate quickly in labs, given the frequency at which supplies are ordered and received. However, they are not necessarily easy to get rid of in sustainable ways. Many labs end up reusing some fraction of the styrofoam boxes and freezer packs they receive for experiments, which seems to be the most common and easily practiced alternative to throwing these shipping components away. Materials: Another approach for sustainable disposal of styrofoam and freezer packs is recycling them. A handful of life sciences companies do sponsor recycling programs for styrofoam containers, including Sigma-Aldrich, Qiagen, and New England BioLabs (which has run such a program for over thirty years), but most companies do not, given the cost of such programs. Alternatively, for-hire companies specializing in styrofoam recycling can be contracted by universities, but again the associated cost can be a deterrent. Even rarer are return programs for freezer packs, as the combination of contamination concerns and the cost of re-sterilizing seems to discourage their implementation. The amount of plastic materials that biomedical research labs use are also quite high, though recycling used materials such as pipette tips, serological pipettes, conical tubes, or microcentrifuge tubes is often not convenient or feasible due to biological contamination. However, containers for materials (i.e. cell culture media bottles, pipette tip boxes) can be sterilized and disposed of much more easily. In the case of pipette tip boxes, several companies–such as Fisher Scientific, USA Scientific, Corning, and VWR–do sponsor programs where discarded boxes are collected or received via mail for recycling. While achieving greener laboratories first requires implementation of sustainable practices like those listed above, the success of such efforts ultimately depends on institutional support and researcher engagement. Even if such resources and programs are offered by companies or research institutions, scientists need to be made clearly aware of their existence to take advantage of them. Accordingly, university- or departmental-level promotion of and encouragement for sustainable practices could substantially increase researcher interest and participation. Implementing reward-based systems, including financial incentives, for labs that ‘go green’ could also help motivate investigators to commit to practicing sustainable science. In being more conscious of the environmental footprint that biomedical research leaves behind, scientists can clean up our own backyard and stand on firmer ground when encouraging others to do the same. 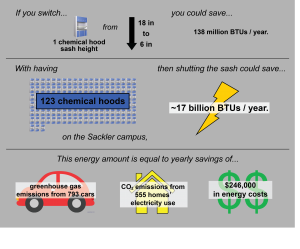 Thank you to Tina Woolston and Shoshana Blank from the Tufts Office of Sustainability and to Stephen Larson and Josh Foster from Tufts Environmental Health & Safety for providing information and resources on chemical hood numbers, energy usage, and costs.